You can find the new version Klein here, the smaller profile greatly increases flavor. Please use the drop down box to select the correct version! 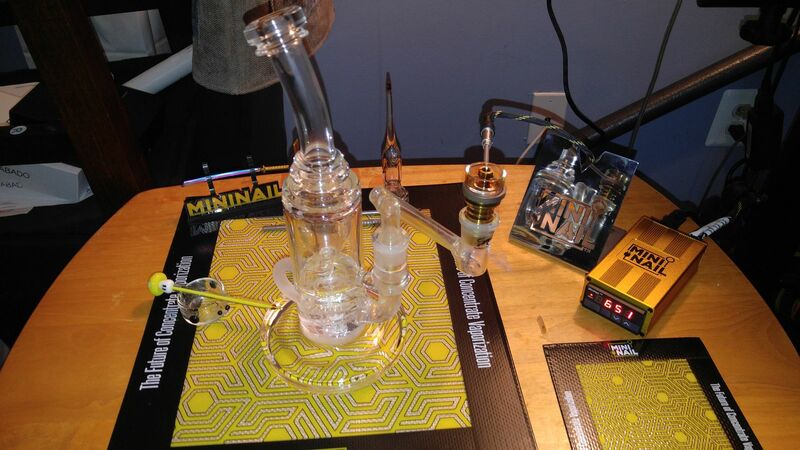 Titanium Domeless Nail is not included. i cant say enough good things about this piece. no drag what so ever, super frothy diffusion, perfect function, classy and beautiful. this piece is a no brainer to buy. if you love your concentrates then you need to get this. the flavor is astronomical and the pull is silky smooth. ive seen lots of reviews (what up jolie olie @customgrow420 and josh @strain central) ;p that made me want to purchase this piece. so fear not when purchasing this piece. you wont regret it. Live how sturdy this incylcer is, an fantastic pull I love the swirls as the water goes down. And even though I'm an very clumsy person the base always makes it stand strong, I love this peice! Love this piece. Perfect function and height. New favorite rig and daily driver. Love everything about it; the gorgeous blue stardust glass, to the pull, it’s a f*cking amazing rig! Only thing is I wish I could have gotten the female connection rather than the male.. but all in all, it’s worth every dollar.